If I’m being honest, I’ve never been the biggest yogurt fan. My younger brother is, and always has been! But not me. It’s alright, I guess. Though many commercially produced yogurts are SO high in sugar that you’ll want to be careful which ones you incorporate into your diet. Many are not a great addition to a healthy diet. 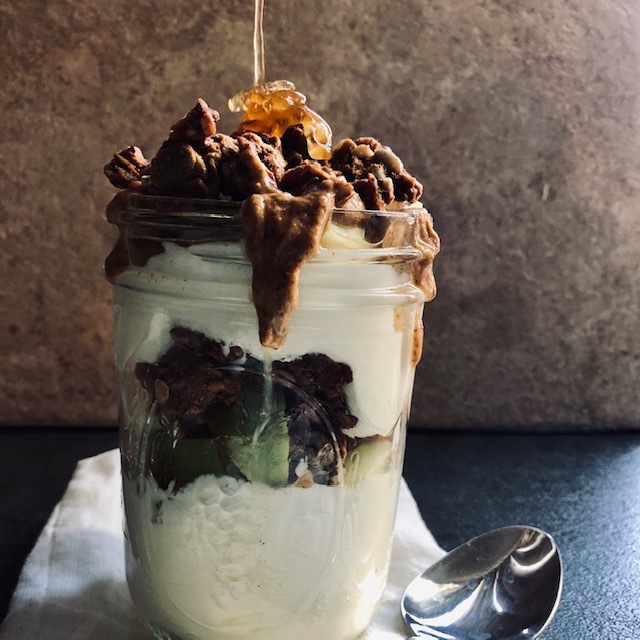 That being said, these Paleo (that’s right, you heard me, PALEO) friendly Apple Crisp Yogurt Parfaits are a great addition to your breakfast routine! I’m sure you’re asking, how can a yogurt parfait be Paleo? Isn’t dairy a no-no? Yes, it is off-limits, but there are a couple of brands on the market that are dairy-free and also have no off-limits thickeners or additives. The two brands I’ve tried and like best are Kite Hill and Forager. Of the two, Kite Hill ranks higher, in my opinion, because it’s much thicker than Forager. While I said yogurt isn’t my favorite food, I really enjoy this dish. Mostly, I’m not a fan of plain yogurt. It’s a texture thing for me, so add in some nuts and crunchy granola and I’m on board! This parfait uses plain Kite Hill Greek Yogurt (I like the Greek better as it’s much thicker!) and adds in just a hint of honey to give it sweetness. By not using already sweetened yogurts, you can completely control how much sugar you’re adding. This makes this dish also 21-day sugar detox friendly as well! Just leave out the honey altogether and use a green apple like I did. I use Kite Hill yogurt as a sour cream substitute all.the.time. You can find it showcased in a ton of my recipes. If you need some more inspiration than just these Paleo Apple Crisp Yogurt Parfaits, check out these other recipes that highlight Kite Hill as well! 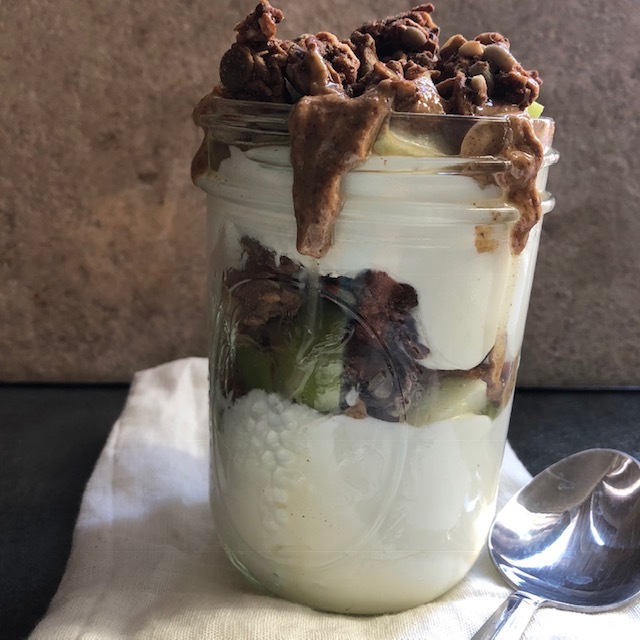 In a mason jar or parfait glass, place 2 oz of yogurt in the bottom of two jars. Layer 1/2 the apples, granola, cinnamon, almond butter, and honey in each jar. Top with more yogurt and repeat layering. Serve cold.